Revel launches Concerta on-wall speakers and wireless sub | What Hi-Fi? We've just run a test of wall-mounted speakers in the February 2012 issue of What Hi-Fi? Sound and Vision, on sale now, and the latest to join the on-wall party is Revel with its new Concerta series. Concerta speakers are voice-matched for use in any combination. The range includes the LCR8 (above), a three-channel LCR (left/centre/right) system mounted in a single enclosure (£750); the C10 centre channel speaker (£500); and a choice of M10 (£500) and M8 (£250) satellites. For extra bass, there's the 250W B120 subwoofer (above, £900), which is also available with a wireless connectivity option. Each rigid aluminium enclosure is designed to complement the look of LCD and plasma TVs, says Revel. 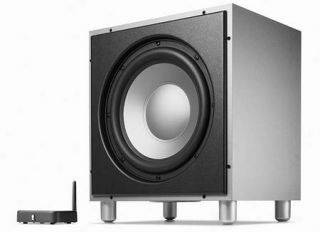 A full 5.1 Revel Concerta system with wireless sub will cost £3020, and goes on sale from February.